And so ends another successful Las Vegas Market! Our summer showroom had higher than average foot traffic playing host to representatives from all over the United States and international businesses from Jamaica, Guatemala, Panama and more. 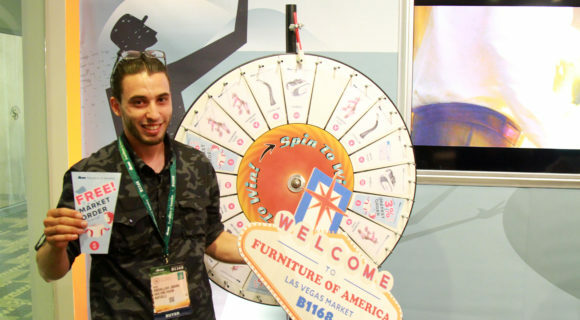 The Spin-to-Win Wheel was a sensation with its grand prizes of: One free market order up to $10,000, 10% off any order, 5% off any order, and 3% off any order. Big congratulations to Awad Home Fashion Inc., winner of the free market order up to $10,000! And congratulations to the rest of the winners! We look forward to doing more giveaways and continuing to work with you, our loyal customers. With your continued support, the coming winter market should be bigger and better than ever! This entry was posted on August 7, 2017 by FOA Team.